An internationally recognized soloist, Anaïs Gaudemard quickly stood out in the musical world winning First Prize at the International Harp Contest 2012 in Israel, 2nd Prize and the Special Prize from the Münchener Kammerorchester at the ARD Munich Competition 2016. In 2015, Anaïs received the Thierry Scherz Prize at the Sommets Musicaux in Gstaad. A prize which offerered her the opportunity to record her first CD with orchestra. A CD dedicated to Debussy, Boieldieu, Ginastera Harp concertos, released for Claves Records, and which was nominated at the International Classical Music Awards 2017. Anaïs Gaudemard has had the privilege to collaborate with the Lucerne Festival Orchestra, Symphonie-Orchester Des Bayerischen Rundfunks, Israel Philharmonic and Symphony Orchestras, Orchestre de Chambre de Lausanne, Orchestre de l’Opéra de Rouen; under the baton of Claudio Abbado, Mariss Jansons, Leonard Slatkin, Leo Hussain, Emmanuel Krivine, Constantin Trinks and Jamie Phillips. Anaïs recently made her debuts with the Hong Kong Sinfonietta, l’Orchestre Philharmonique de Strasbourg, Württembergisches Kammerorchester Heilbronn, AMG-Konzerte Basel, I Pomeriggi Musicali, Gulbenkian Orchestra conducted by John Axelrod, Stefano Montanari, Ton Koopman. From September 2018 Anaïs will be Associate Artist of the Orchestre Symphonique de Mulhouse. 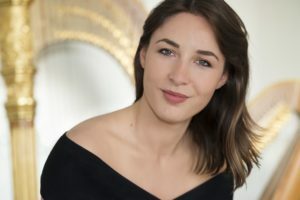 Anaïs Gaudemard studied at the CNSMD in Lyon then at the HEMU in Lausanne where she obtained the Master of Arts Soloist with the highest honors. Anaïs plays on a Style 23 Gold Concert Grand harp offered by Lyon and Healy, Chicago at the 18th International Contest in Israel.